Providence Care supports the training of nursing and allied students from across Ontario. Students work within an interprofessional team to provide recovery oriented, client and family centred care. At Providence Care, students are accepted for placement in a variety of settings including: Providence Care Hospital, Mental Health Services Community Programs, and Providence Manor. The development and education of our clinical students is a key component of the Providence Care Strategic Plan. We value the opportunity to contribute to the growth of our students by offering excellent clinical placements and the chance to partner with our outstanding staff. We believe today’s academic health science environments must focus on advancing clinical professions within the domains of practice, education, research and leadership. Our intent is to provide a meaningful professional and rewarding clinical placement. If you are interested in securing a clinical student placement at Providence Care Hospital or Mental Health Services Community sites, please contact the Clinical Education Coordinator at cleghorm@providencecare.ca. 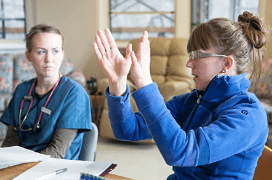 If you are interested in securing a clinical student placement at Providence Manor, please contact the Quality Improvement Facilitator at kilpatrv@providencecare.ca.